Crucial DDR4 memory allows you to get more out of a single memory module; higher density modules allow for greater RAM capacity, paving the way for next-gen performance. DDR4 memory is up to twice as fast as DDR3 technology when it was introduced, delivering 50% more bandwidth and 40% more energy efficiency. Upgrade to Crucial DDR4 and enjoy faster application load times, increased responsiveness and the ability to handle data-intensive programs with ease. 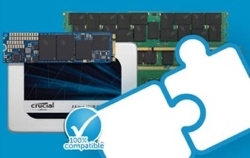 Browse our DDR4 memory below for more information.